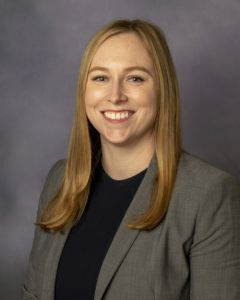 Kathleen is an experienced trial lawyer who joined Moore Ingram Johnson & Steele in 2018 as a member of the firm’s Litigation Department. Her practice areas include commercial litigation, business litigation, and insurance and liability defense. Kathleen is admitted to practice in all Florida state courts, and she currently practices in our Orlando, Florida office. Born and raised in Orlando, Florida, Kathleen attended the University of Florida, where she earned a Bachelor of Arts in Classical Studies. After completing her undergraduate degree, she attended Florida International University College of Law in Miami, Florida. In law school, Kathleen was a Notes and Comments Editor for the Florida International University Law Review, member of Moot Court, teaching assistant for Legal Skills and Values, and served as a Judicial Extern to the Honorable Frank Shepherd at the Third District Court of Appeal. Upon graduating from law school, Kathleen worked at the Public Defender’s Office for the Ninth Judicial Circuit of Florida, where she gained extensive courtroom and trial experience. Kathleen has tried nearly 70 cases to verdict, ranging from misdemeanor Possession of Cannabis to Second Degree Murder. Kathleen is an active member of the Central Florida Association for Women Lawyers and Orange County Bar Association Young Lawyers Section, and is a current member of the Diversity and Inclusion Committee of the Florida Bar. In her spare time, she enjoys volunteering with the Adult Literacy League, spending time with her friends and family, and cheering on the Florida Gators.